This thick soup is my family's all-time favourite. It is rather easy to make. 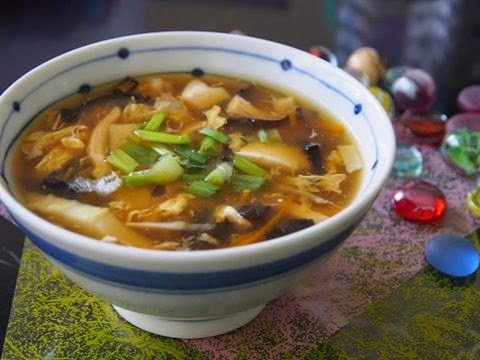 The taste of the soup varies slightly depending on the type of stock used. You can make your own chicken stock or use store-bought chicken stock. The heat comes from the pepper, ginger and chilli oil/powder and the sourness from the vinegar. My family prefers chilli powder to chilli oil. This is the chilli powder I am using currently. 1. If you are using fresh bamboo shoot, you need to pre-boil it first. 2. Bring the chicken stock to a boil, if you wish to add chicken breast, you can boil 1 chicken breast in the stock for about 10 minutes till cooked and set aside to cool before shredding. 3. Add carrot, mushroom, bamboo shoot, ginger and black fungus to the boiling stock. Cook on medium low for about 10 -15 minutes. 4. Slowly pour the egg in and use a pair of chopsticks to swirl the soup at the same time. 5. Add tofu and shredded chicken and then seasoning according to your taste. 6. Lastly, use a spoon to stir to dissolve the corn flour well before adding to the soup. Add slowly, stirring at the same until the soup is thicken to your preferred consistency. 7. Garnish with chopped spring onion and/or coriander before serving.